In the end, I think everyone came out a winner. The Hurt Locker went home with the trophy and they definitely deserved it. The film really used the setting of war to tell a story of addiction and self-conflict. Many people may claim that it only won because of its political agenda, but they would be wrong and I would even question if they actually saw the film. The war is merely a background in the story and at no point can I remember the film showing why one way of thinking is better than another. Avatar's nomination was understandable for the pushing of technology that the film presented. It really took a grandeur approach to melding computer technology and live action film. Its story was not the strongest point, but it didn't need to be. The story simply needs to move the direction and actions of the characters along. I feel that too many people went into Avatar expecting a new and original story. That wasn't the point of the film, the point was to tell a story in a new kind of presentation, and I think that presentation worked. I was more excited about this year's academy awards than previous years, simply for the new change this year. Instead of only having 5 films in the Best Film category, this year's nominations doubled to 10. This allowed for some of the more popular and widespread films to be considered for Best Film. Some of these included Avatar, The Blind Side, District 9, The Hurt Locker, and Inglourious Basterds. I have been telling everyone that District 9 was my pick for Best Film since I saw it, but I felt that these other films definitely deserved the nomination. In previous years its been a joke when anyone says, "It's an honor just to be nominated," but this year it really rang true. Some of these films were not going to win, but to be recognized among the best of the best is really a compliment to the people who created and worked on them. I have not seen The Blind Side as of yet, but it looked interesting from the commercials/previews I saw, and Sandra Bullock seemed to give a very powerful performance (which I'm glad she won Best Actress, I've been a fan of her work for a while). Inglorious Basterds was a great film and I applaud Tarantino for using subtitles for most of the film. It makes each character feel real and authentic. 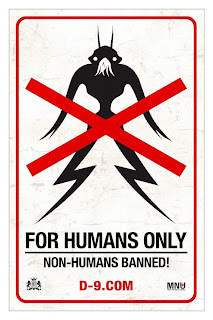 District 9 had been my pick for best film of the year, and with good reason. While the very basic themes of the film have been used before, it was very original to use the themes in the way that Neill Blomkamp did. I would argue that it is the most original science fiction film I've seen in the past decade. Not to mention Sharlto Copley did an amazing job as Wikus van de Merwe for his first time acting. Without turning this into a movie review like every other blog on the Internet, I got a chance to see Alice in Wonderland this week and enjoyed it. It's a good film but I had a few prefabricated ideas going in that made me a little disappointed (I still enjoyed it though). The film should probably be named "Return to Wonderland" as it takes place several years after Alice visited Wonderland the first time. She is now 19 years old and doesn't remember her first visit. I was under the impression that the film would be a retelling of the original story but with Tim Burton's vision. Speaking of Tim Burton's vision, let's talk about the creepiness factor. On a scale of 1 to 10, I would put it at a 6. Wonderland definitely had burned down villages, eerie forests, and a Mad Hatter who was more "bonkers" than mad. 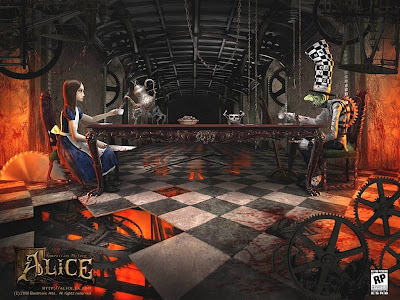 I guess I can credit this to my acceptance of American McGee's version of Alice as the one that is best interpretation. The American McGee version changes a few background pieces around but gives the story a much more sinister and evil perspective. I guess I had forgotten that Tim Burton's version was in fact Disney, and I was reminded of such by the Mad Hatter's dance. As far as the 3D effects, it didn't seem to be necessary. Rather than being filmed in 3D, it was formatted in post-production, and I think it shows. While past GDCs have been about hardware and technology with some information about upcoming titles. this year's definitely incorporated both. This year revealed the Wii, I mean Playstation Move. A lot of companies are noticing the social networking games and the number they bring, and hoping to tap into the market with titles such as Battlestar Galactica Online. The biggest news, I think, to come out of this year's GDC was the U.S launch date for last year's announcement of OnLive. OnLive is a cloud computing on-demand gaming service. Its easiest to think of it as Netflix, but for games. You sign up for the service ($14.95 per month) and have ability to stream games that you can buy or rent from the service. This allows for consumers with low-end systems to play the high-end games. Last year at GDC, Crysis was demonstrated on a low-budget laptop, running at 60+ FPS. This service can also allow cross-platform gaming, meaning a PC user can have access to PS3/Xbox360 games, and vice versa. The service is engineered through data centers regionally located to the consumer, and the video is streamed across broadband to the user's system. It is currently set to launch June 17, 2010. This service has the potential to radically change the industry. There is no retailer, many publishers have already signed on with launch titles from Electronic Arts, Ubisoft, 2K Games, THQ and Warner Bros. Interactive Entertainment. There is no console to buy, PC users simply sign up and download a OnLive browser. OnLive can also be used on Home TVs with the use of a MicroConsole, expected to be available later this year. 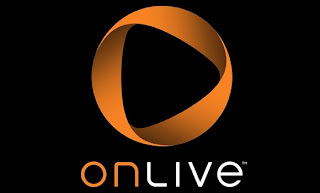 There are no necessary upgrades needed, OnLive servers run the game which is then streamed back to your local system. While all of this may seem like a good idea, it still remains to be seen if this service will work as smoothly as the developers of OnLive say it will. The only kind of complication I can see on the surface of a service like this if they try to include MMO's into the fold. MMOs are ran on their own set of servers, so while a data center of 100 servers may be able to run Assassin's Creed 2 for 1000 users, it would take nearly that many servers to allow a single cluster of players to play a MMO. There would also be the price factor, in that would the consumer be paying $15 a month for access to OnLive AND $15 a month for gameplay?